12.07.2015. Sachsenring, Germany MotoGP. Moto2 Gopro Motorrad Grand Prix Germany. 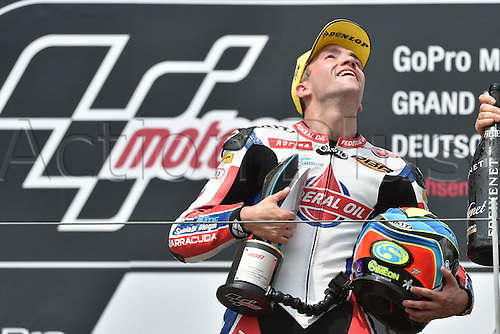 Belgian Moto2 rider Xavier Simeon of Federal Oil Gresini Moto2 cheers on the podium after winning the Motorcycle World Championship Grand Prix of Germany at the Sachsenring racing circuit in Hohenstein-Ernstthal, Germany, 12 July. Grand Prix Gopro Motorrad Grand Prix Germany.